Mix the fruits and peel, pour over half the brandy, and soak overnight. Preheat the oven to 150°C/gas 2. Grease a 22cm, round, deep cake tin. Line with greaseproof paper so it comes 5cm above the sides of the tin. Cream together the butter and sugar. Gradually add the beaten eggs, plus a little flour with each addition. In another bowl, sift together the remaining flour, salt and spices. Stir in to the cake mix. Fold in the soaked fruit, ground almonds, and cherries. Add the citrus juice, nuts and treacle. Spoon in to the tin. Level the surface, leaving a small dip in the middle. Tie a double thickness of brown paper around the tin, again coming above the sides. Bake for 3½-4 hours, or until a skewer comes out clean. If necessary, towards the end of cooking, cover with a circle of foil with a hole in the middle to prevent burning. Cool. Remove from the tin, prick the base with a skewer and spoon over the remaining brandy. Wrap in greaseproof paper and mature in an air-tight container for up to three months. 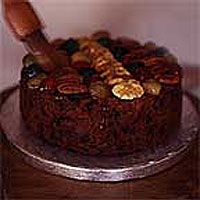 To serve, brush the cake with melted apricot jam, add a thick layer of marzipan, and toast gently. Or heat 4 tbsp apricot jam with 3 tbsp brandy, brush over the cake, cover with nuts and glacé fruit and brush with the remaining jam glaze.